Aerojet Rocketdyne has a double celebration after today's successful launch of NASA's and NOAA's GOES-S satellite, propelled into space making this the flight of the 100th Aerojet AJ-60A solid rocket booster (SRB), the largest monolithically wound SRB ever. 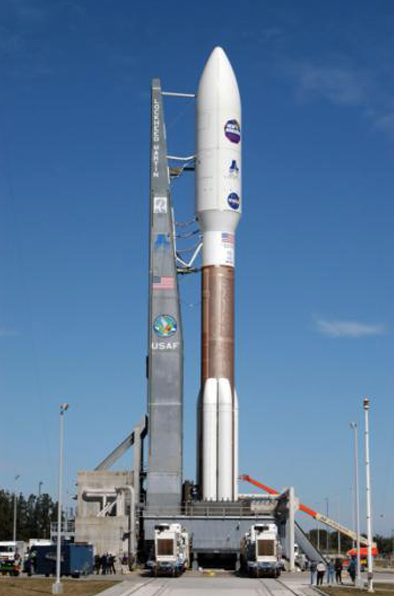 The AJ-60A is one of numerous Aerojet Rocketdyne products on both the ULA Atlas V launch vehicle and the Lockheed Martin-built Geostationary Operational Environmental Satellite-S (GOES-S). These include the Atlas V’s RL10C-1 upper-stage engine, pressurization tanks and various controlling thrusters for both the launch vehicle and satellite. GOES-S is the second in a new generation of geostationary-orbiting weather satellites built under contract to NASA for the National Oceanic and Atmospheric Administration (NOAA), which is responsible for the nation’s weather forecasting. NOAA requires three GOES satellites on orbit: one each, overlooking the U.S. East and West Coasts, and one on-orbit spare. The GOES-S launch utilized four AJ-60A SRBs, bookended by the 97th and 100th units to fly to date. “What’s important to note about this milestone is that it was reached with 100 percent mission success,” Drake said. The Atlas V’s Centaur upper stage, meanwhile, relies on Aerojet Rocketdyne’s RL10C-1 engine, which generates 22,900 pounds of thrust to deliver payloads to orbit. Variants of this engine have been in use for five decades – 487 have flown to date – and are still relied upon today to launch the vast majority of operational U.S. government satellites and exploration spacecraft. The Centaur upper stage also uses smaller Aerojet Rocketdyne thrusters for pitch, yaw and roll control, while both stages of the Atlas V employ pressurization vessels built by Aerojet Rocketdyne’s ARDÉ subsidiary. The GOES-S satellite itself is full of Aerojet Rocketdyne propulsion systems, including specially designed Low Thrust Rockets (LTRs) for attitude control and station keeping, and super-efficient electric thrusters for station keeping and for decommissioning the satellite at the end of its service life. Station keeping refers to maintaining a geostationary-orbiting satellite’s position relative to the Earth’s surface. Aerojet Rocketdyne is a leading provider of electric thrusters, which require far less propellant than conventional chemical propulsion systems. This enables spacecraft designers to dedicate more mass to the satellite’s mission, such as data collection or communications.